Winter is dry. The air is dry. Hydration becomes more important, surprisingly, than in the warmer months. Why? It is easy to miss how dry we can be. It is not just losing moisture in sweat, but also losing moisture to the dry air on top of losing it through the sweat. An indoor treadmill run in the dry air, sweating during an outdoor run or x-c ski, the chlorine from the pool, and frequent showering dries the skin. Staying hydrated is very important especially when exercising/training because hydration effects the immune system. The immune system gets compromised when we are dehydrated. And our largest organ, the skin, tends to be very dry in the winter and keeping it moist is likely to be overlooked. Staying hydrated is not just about drinking water, but also about keeping the skin moist by using oil on the skin. Lotion is okay, but lotion tends to have chemicals as well as alcohol in it so it dries quickly…hmmm. 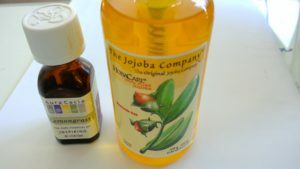 Anyhow, a little jojoba lotion with a few drops of lemon grass essential oil is a favorite of mine. The oil is not too heavy and the lemongrass is light and refreshing. Continue to drink water, but consider the skin. After a workout and a shower, rub it in! This entry was posted in Blog, Health and Nutrition, Triathlon. Bookmark the permalink.